Dude, u r one crazy mo-fo! Love it! So cool... they need the iphone export wizard - i RTFM'd the iphone packager, and seems like a major pain. Was it very difficult? Looks quite involved... This could be huge!! Any chance you can post more detail on the process of porting to ipa? All the doc assumes using Flash CS5, but i am using Flash Builder "Burrito" - assume that is OK? Also, i could not import the sample code zip into Burrito, said was not a valid project. Tried both pointing to the zip and to the folder of the unzipped contents. Any thoughts? Can you use the phone's GPS to get the current location? That would provide a better opportunity for smarter apps. Fantastic! I was able to get it work on my development iPhone2G. Had some problems with Hero not running exactly as it should...and, of course, no hardware "back" button. Other then that, it does run, albeit slow. GREAT Job and I do see what is possible, and I believe Adobe will definitely improve this one. Another cool blog. Right On! "c:\Program Files\Adobe\Adobe Flash Builder Burrito\sdks\4.5.0\bin\mxmlc" -load-config "c:\Program Files\Adobe\Adobe Flash Builder Burrito\sdks\4.5.0\frameworks\airmobile-config.xml" -library-path -sp -o MyMobileApp.swf "c:\Users\Morgan\Adobe Flash Builder Burrito Preview\MyMobileApp\src\MyMobileApp.mxml"
Sorry for the delay - Looks like your library path is missing the swcs. So I tried your code today with 2.3 and got this error, any thoughts? VerifyError: Error #1014: Class mx.controls.sliderClasses::Slider could not be found. You have to add references in your flex project to adobe's mx.core libraries. In Flash Burrito, it only loads the spark stuff, and the ESRI API still uses mx stuff. Are you saying that I need to add a source path to the 3.5 sdk so that it can find the missing components code. or do you have a different method in mind. 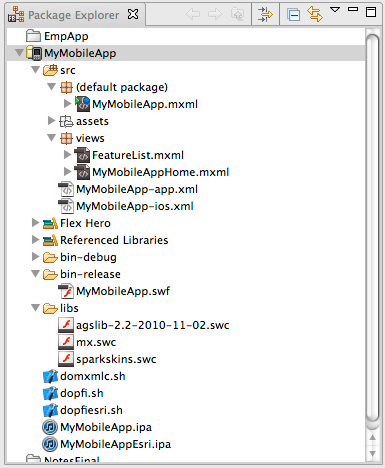 No - just add the mx.swc and sparkskin.swc to ur libs folder. Save the link as a file - do not open it directly specially with IE. I can see the objects in debug mode, but it doesn't want to bind the attributes for some reason. Do you find that performance is shot by the adobe framework? Getting better with each release of AIR - tested up tp 2.6 - not 2.7 yet - and yes, in the version that I posted, it is because of the mx dependency - which we fixed in the soon to be released 2.4 API. Thanks, again! Any thoughts on persisting the whereInput's text property? It always gets reset to the default, but I want it to show the last search string. I tried removing the intermediate QueryExecuteView to try using popView() (instead of popToFirstView()) on the QueryResultView's Home button, but no luck. I thought each view's data property was supposed to be maintained in the stack. Well, if it is, how do I use it? Thanks! Although I did *not* have to set my destructionPolicy='never'. right before pushing the QueryResultView. Then when I use navigator.popView() to go back, my last search string is there. I also moved the BusyIndicator into the QueryView and toggle it's visibility with executing/handling the query/response. is it possible to test your sample application over an emulator? or we need a device for that? 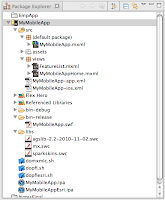 FlashBuilder 4.6 comes with Emulator ! thanks for the hack! I have a question though. Is it possible to run the ArcGIS Viewer for Flex application on my iPhone or iPad? No. There are two specific issues related to this. The ArcGIS Viewer for Flex is a standard Flex project, it would need to be re-written as a Flex Mobile Project. The ArcGIS Viewer for Flex uses Flex modules. These are not supported in Flex mobile projects. What's up with that, is it true that to use Esri Flex on iOS, one needs to ditch the viewer? Actually this has nothing to do flex - iOS does not allow any application to be modular - that means extra executable code cannot be downloaded after the fact - so yes - you will have to rewrite the app - some people have done this as they will have to rewrite it to create a better mobile experience.